Powers/Abilities: Red Ronin possesses Superhuman Class 100 strength, and can fly at subsonic levels via atomic propulsion units in its legs. Red Ronin is equipped with a vast array of weapons. 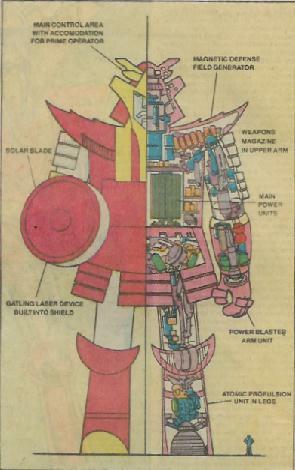 His detachable shield with "solar blade" Gatling ultraviolet laser device, which stores the sun's energy and its tremendous heat allows it to cut through virtually anything. In addition, the shield can be hurled as a weapon, its sensors allowing it to strike a target even when poorly aimed, and it rotary homing device brings it back to Ronin's arm. It has a magnetic field generator in its epaulets (which supplies power for shields located at vital areas around the body). Its arm-mounted power blasters are capable of a concussive force equivalent to 100 tons of TNT. In addition, it could release "Magneclamp cables" from its boot units, which were strong enough to hold and support a being as massive as Godzilla. Later it was equipped with the ability to automatically repair its circuitry and detach its hands from its arms, keeping control of them. Though it can be set onto limited programmed behavior and responses (such as attack or war mode), it typically requires direct instruction from a pilot, based within its head, to command it. Its reflexes and fighting skills are dependent upon its operator, to whom it is connected by cybernetic linkage. (Godzilla#6) - Stark International's technicians neared the completion of SJ3 RX, designed by Tamara Hashioka and Yuriko Takiguchi. It was noted that SJ3 RX was only a temporary code name; it would respond only to the name given it at the time of activation by the prime operator. The technicians showed their progress to Yuriko, telling him that it was complete, though it would require a series of thorough checks to find an eliminate any possible bugs. While they discussed who would operate the giant robot (Yuriko assumed it would be a SHIELD agent), twelve year old Rob Takiguchi watched on, making plans of his own. Feeling that his grandfather's creation should be used to help Godzilla rather than to kill him, Rob sneaked into Stark International, slipped into the robot's helmet. Having studied his grandfather's plans often enough to know where everything was located (though not necessarily what each thing did), Rob donned the cybernetic helmet, and flipped a switch. A power surge rendered Rob instantly unconscious. (Godzilla#7) – With Rob unconscious at the helm, the robot began to "sleepwalk." As it traipsed across the base, Jimmy Woo managed to gain entry to it and shut it down. Later, Rob once again sneaked into the robot, which he had named Red Ronin, and this time he managed to gain control without harm to himself. He then took flight and tracked down Godzilla, attacking him in an effort to keep the U.S. government from launching nuclear weapons at the behemoth. (Godzilla#8) – Hoping to drive Godzilla from the nuclear missile base, Rob activated Ronin's laser blade, though he was afraid to use it for fear of hurting Godzilla, who nonetheless retaliated with his nuclear fire. Eventually Rob fought back, but when the SHIELD Behemoth carrier (under the command of "Dum Dum" Dugan) prepared to attack Godzilla (ironically, to protect young Rob), Rob turned the laser blade against the Behemoth carrier to protect Godzilla from it. Rob then used Ronin's Magneclamp cables to lift Godzilla into the air to take him away from Behemoth and the missile base, but Godzilla mistook his intentions and tore the cables apart, knocking both Ronin and Rob off balance (and knocking the cybernetic helmet off of Rob). Godzilla plunged into the San Diego bay while Ronin landed atop a pair of naval ships. Godzilla resumed his assault on Ronin, and Rob was forced to fight back. Despite the desperate struggle against Godzilla, when the Behemoth carrier arrived, Rob had Ronin attack it yet again; Godzilla perhaps began to suspect that Ronin was not his enemy. With the Behemoth's power temporarily knocked out, Rob was able to convince Godzilla via Ronin to take off into the desert. (Godzilla#9) – Rob exited Red Ronin, receiving reprimands from his grandfather and Dugan, but Yuriko also reminded Dugan that Ronin would only respond to Rob's brain patterns. Annoyed by this limitation, Dugan responded that they would have to do without the robot in the future. 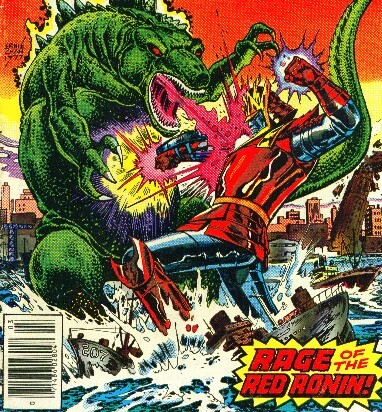 (Godzilla#10) – As Red Ronin was taken into a hangar at a San Diego naval base, Rob sneaked aboard Ronin once again. Making his way into the control center, Rob activated Ronin's jets and escaped aboard the robot. He tracked down Godzilla, finding him in mid-battle with Yetrigar (whom he named) within the Grand Canyon. (Godzilla#11) – Ronin, with Rob in control, attacked the giant monsters with his laser sword to stop their fight, but it soon turned into a three-way fight. Rob and Ronin finally ended it by blasting a large amount of rocks above Yetrigar, burying the creature. When Godzilla lost interest and wandered off, Ronin took flight. (Godzilla#12) - Rob piloted Ronin through the sky while he criticized himself for seemingly slaying Yetrigar. Shortly thereafter, he was confronted by Triax, one of the Mega-Monsters sent to conquer Earth by the alien Megans; almost immediately thereafter, he was joined by Godzilla, whom the Megans' enemies, the Betans, had sent to oppose their monster. (Godzilla#13) – Rob used Ronin to assist Godzilla against Triax, stopping him from attacking a nearby city, but the Mega-Monster was soon joined by its partners, Krollar and Rhiahn. Ultimately, however, Rhiahn (see comments) used its caudal (tail) bio-blade, decapitating Ronin. Rob was trapped within the robot's head as it flew through the air. (Godzilla#14) – After being decapitated by Rhiahn, Ronin was incapacitated, and Rob was rescued from the wreckage. (Avengers I#197 (fb) - BTS) – Stark International continued the process under the supervision of Dr. Earl Cowan. (Avengers I#197) – At Stark International, Mr. Karnowski discussed with Dr. Earl Cowan how Red Ronin's reconstruction had been completed, with the final testing to be begun the following day. Cowan, however, then clubbed Karnowski with a wrench, revealing his intent to use Ronin for his own purposes. Shortly thereafter, Cowan activated Ronin (having clandestinely altered its cyber-helmet such that it would respond only to his commands), smashing up through the chamber and flying off into the sky. Cowan intended to use the robot to start World War III! (Avengers I#198) – Beast and Wonder Man, who had been out partying, saw Red Ronin making its way through Hudson Bay, and were soon picked up by the rest of the Avengers. Their attacks on the robot proved mostly futile. (Tales of the Marvels: The Wonder Years#1 (fb)) - While crossing the Bronx, Red Ronin nearly stomped on Cindy Knutz. She was saved by Wonder Man, and Red Ronin continued a ten mile swathe across the city boroughs and did eighty-six million dollars worth of property damage. (Avengers I#198) – The Beast and Jocasta found a door panel in Ronin’s foot and made their way inside, and soon after, the Wasp and Yellowjacket flew into its helmet through its eyeholes. There, the two confronted Cowan, who tried to explain why he was using Ronin to incite World War III in an attempt to bring humankind together again. Cowan used special fans--designed to dispel gas assaults--to flush the two heroes back out of the robot, after which he sealed the eyeslits. 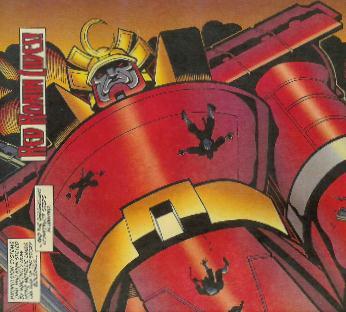 Iron Man used his armor--powered by the Behemoth carrier--to short-circuit Ronin, but in the process, not only knocked Cowan unconscious, but also damaged some of Ronin’s components. With its last order from Cowan being "Destroy!," it made its way to Cross Tech Enterprises, where it surprised an unwary Hawkeye. (Avengers I#199) – Ronin began to attack Cross Tech Enterprises, with Hawkeye’s defense proving fruitless. He soon met up with his former teammates in the Avengers and planned a new defense against the robot. Meanwhile, Beast had gotten himself tangled in some of Ronin’s wiring, but eventually freed himself and he and Jocasta found their way to the control center. Cowan awoke, only to realize that Ronin’s weaponry was haywire, and was set on "destroy." The Avengers then launched another attack on the robot, and managed to separate it from its solar-blade, using it to cut the robot in half at the torso. With Cowan, Beast and Jocasta desperately trying to shut the robot down from the inside, Ronin proceeded to crawl towards the Long Island Expressway, where hundreds of civilians were in its path. At the last second, the Beast correctly determined and pulled the right plug, shutting down the robot. Its parts were rounded up in a giant container, and a the Behemoth carrier carried them off. (Tales of the Marvels: The Wonder Years#1 (fb)) - Despite the massive destruction caused by Ronin, there were no fatalities. 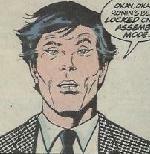 (Solo Avengers #15/2 (fb)) – Stane International took over ownership of Ronin’s remains. Karaguchi Inoyawa proposed to rebuild Ronin to use for peaceful purposes, and the robot was rebuilt. (Solo Avengers #15/2) – The top half of Ronin was unveiled to the public at a Stane trade show, where Inoyawa got the Wasp’s attention by pretending to be eaten by the robot. Joe Kilman, a disgruntled former employee responsible for Ronin’s reprogramming, gained access to his control board and attempted to use him to strike back at his former bosses. However, Red Ronin sprung to life too fast, knocking Kilman unconscious, and went into its "assembly" programming, forcibly leaving the stadium where the trade show was being held at to search for its remaining half. With Inoyawa giving her directions via radio, the Wasp entered Ronin and tore apart his internal logic circuitry, causing it to behave in a drunken fashion before shutting down once again shut down. (Wolverine ‘96#1 (fb) bts) – At some point, the Red Ronin robot was handed over to Fujikawa Electronics, a firm in Japan which worked with artificial intelligence. (Wolverine ‘96#1) – Yukio informed Wolverine about the Ronin project, and that the Japanese government, the Hand (a mystical sect), and Clan Yashida were all out to retrieve it. The two arrived at Fujikawa headquarters to find a group of the Hand arriving. The two fought the ninjas on and around Red Ronin. During the battle, Ronin was activated by Tsu Fwon, a Fujikawa employee working with General Hirito of the Japanese government. The two, along with Sunfire, attempted to shut down the robot. While Sunfire contended with one of Ronin’s detachable arms, Wolverine made it inside and stopped the leviathan seconds before it stomped on a bus full of people. (Thunderbolts II#13) - Needing a target to lure the newly-formed team of Avengers into a surprise attack by the Thunderbolts, a secret government cabal comprised of Henry Peter Gyrich, Carol Danvers, Hank Pym and Dallas Riordan (along with Baron Helmut Zemo) had Red Ronin appear off the shore of New Jersey. The Avengers arrived as expected, but before they could explore the situation, Ronin was teleported away (presumably by Zemo) and the heroes were attacked by the Thunderbolts. (Thunderbolts II#107) - A remote-operated Red Ronin was made part of Baron Zemo's Thunderbolts army. It joined with other members of the army in opposing Wellspring-powered humans in Dallas, Texas. (Civil War Battle Damage Report#1) - Red Ronin, back in Japan, was presented along with the heroes Otomo and the team Big Hero 6 as Japan's line of defense in superhuman situations. (Dark Reign: Zodiac#2 (fb) - BTS) - Fujikawa Enterprises retrieved Red Ronin and stashed the robot away safely. (Dark Reign: Zodiac#2) - Zodiac stole Red Ronin and employed it in an attack on New York City to spread chaos. (Dark Reign: Zodiac#3) - Iron Patriot, Ms. Marvel (Sofen) and Human Torch took down Red Ronin. Cleanup crews worked around the clock to remove Red Ronin and repair the damages caused by the robot. Comments: Created by Doug Moench, Herb Trimpe and Fred Kida. 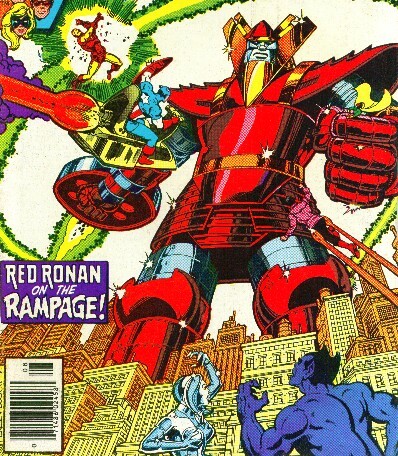 Ronin's name was misspelled "Red Ronan" on the cover of Avengers I#198. Why Ronin got an entry in the Deluxe edition of the Handbook I'm still not entirely sure about. It had been a good 6 or so years since his last appearance at the time, and they generally didn't cover more obscure characters like this. Maybe they were planning a revival that didn't happen. It would be another three years after the entry before he finally returned. 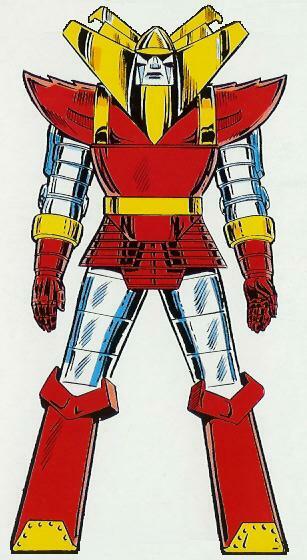 And where was the obvious crossover with the Shogun Warriors? Seriously, that should have been a given. 2005 has turned out to be a good year for Red Ronin. 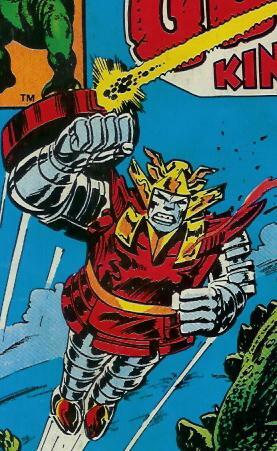 Along with his cameo in Thunderbolts, alternate reality versions of the robot have appeared in Exiles#67-68 (Earth-3752) and in Mega Morphs#2-3 (Earth-Mega Morphs). Rhiahn was mistakenly named Krollar when he decapitated Red Ronin, but he was named correctly in most other instances. In New Warriors II#10, Hollywood producers Jamal and Jay were said to have done a "Red Ronin" movie. or any other "Red" characters. Tso Fwon was an employee of Fujikawa Electronics who had installed a remote interface system into Red Ronin. Upon orders from General Hirito, he prepared to launch Ronin. During this time, Wolverine, Yukio, and Sunfire arrived and battled the robot. Upon its defeat, Hirito killed Fwon. Inoyawa was an employee of Stane International who sought to rebuild Red Ronin for peaceful purposes. During a trade show at the Silverdome displaying part of the robot, Joe Kilman gained access to its controls and caused it to go on a rampage. Inoyawa used radio to direct the Wasp through Ronin to shut it down. After being fired from Stane International, Joe Kilman sought revenge by attempting to take control of Red Ronin. His effort led him to the Silverdome trade show, but upon trying to gain access to the robot he was knocked unconscious.